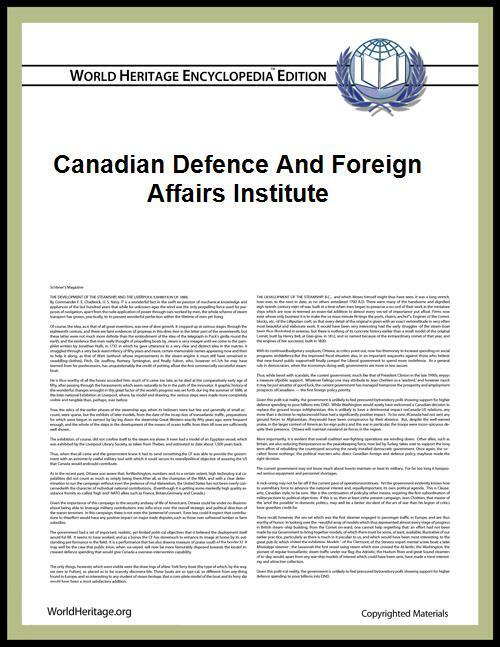 The Canadian Defence & Foreign Affairs Institute (CDFAI) is an independent, non-partisan research institute based in Calgary with offices in Ottawa. Incorporated as a charitable organization in 2001, the institute pursues new ideas to focus the national debate and understanding of Canada’s international policies with the ultimate aim of ensuring a more globally engaged Canada. CDFAI believes that doing so enhances Canadian security and prosperity. CDFAI is dedicated to educating Canadians, and particularly those who have leadership roles in shaping Canadian foreign policy, about the importance of Canada being proactive in world affairs with tangible diplomatic, military and aid assets. CDFAI's Fellows program brings together talented and experienced academics and practitioners with backgrounds in the defence, diplomacy and development. The Fellows support the institute by authoring research papers and responding to media queries. CDFAI also runs conferences and courses, initiates polling, and develops outreach and education projects. CDFAI was established to provide informative and accessible analysis of Canada’s international activities. CDFAI's stated belief is that an understanding of Canada’s foreign policy needs to go far beyond a view of trade and markets. The institute believes that Canada’s international engagement is essential in helping to maintain a world that is friendly to the free flow of goods, services, people and ideas across borders, and the promotion of Capitalism. As such, part of institute’s efforts has been to highlight to connection between a prosperous and free Canada and a world of globalization and liberal internationalism. The result of Canada being a trading nation is that its prosperity is directly connected to international trade, particularly with the United States. Canada has a significant role to play in a world that is changing quickly and not necessarily for the better. As such, CDFAI’s goal as an independent organization drawing on the best talent, from both academia and the 'real' world, is to provide rigorous analysis of, and workable ideas for, Canada’s international involvement. In producing its research, CDFAI works on the foundation of certain assumptions. Principally, CDFAI focus on conducting authoritative research in the field of Canadian international affairs as its core area of expertise. When suitable, CDFAI collaborates with other organizations in order to provide the highest possible quality of analysis. CDFAI ensures that the research it produces, either in partnership or independently, meets the highest level of objectivity and credibility. Ultimately it is the belief that CDFAI can make a real difference in informing Canadians about Canada’s global engagement. Research that is produced by CDFAI is based on certain values and beliefs. A nation’s international influence governs its ability to defend and advance its national interests, be they cultural, economic, social, or political. International status is determined by a combination of cultural influence, diplomatic leadership, economic power, military power or moral authority. Canada maintains its place in the world through a judicious balancing of these five factors. Canada’s quality of life and standard of living depends on international trade and the free flow of people and ideas across international boundaries. Therefore, Canada has a vested interest in a peaceful, democratic world, wherein human rights and freedoms are given the upmost importance. Canada’s global responsibilities ought to determine its spending on defence, security, foreign affairs and international aid. Canada is well positioned to make significant contribution to international peace and security as a result of its economic prosperity and political and social values. If Canada participated in international affairs, at or near its potential, the world would be a more stable and secure place. Understanding Canada’s international interests and the role it can play in the world, in combination with the application of Canadian values, is a prerequisite to acting responsibly as a nation. Authoritative analysis and research is necessary to develop logical arguments and create innovative ideas that persuade Canadians to support an active global presence. CDFAI produces a quarterly newsletter called . The Dispatch brings together CDFAI fellows to provide critical insight on international issues important to Canada in the world. The research that is undertaken by CDFAI through its Fellow program, composed of a strong cadre of former practitioners and academics, is designed to raise the level of knowledge and appreciation about issues of Canadian defence, foreign policy, development and international aid. The institute produces Primer Series written by CDFAI Vice-President Colin Robertson which is meant to give an introductory "need to know" overview, from a Canadian perspective, of important world events. The Strategic Studies Working Group (SSWG) is a partnership between the Canadian Defence & Foreign Affairs Institute and the Canadian International Council (CIC), which incorporates the former Canadian Institute of Strategic Studies. The SSWG is administered by CDFAI which also conducts research and produces publications on security and defence issues on behalf of the partnership. All projects undertaken by the SSWG are first approved by CIC and are co-published or co e-published according to CIC standards. The SSWG has begun to host E-Conferences on issues related to defence and security. The e-conferences are structured to take place over a number of weeks, with each week having a specific topic. The e-conferences include regular commentaries by academics and practitioners, Twitter Q&A's, live chats and major articles placed in national media. The Future of Fighting conference focused on the what the Canadian Forces might look like in the coming decade to reflect the changing funding and combat environment. The Drone Week conference was focused on understanding some of the practical, legal and moral questions surrounding the current use of drones and what future lies ahead for the use of unmanned aerial vehicles. The 3Ds Blog is a site managed by CDFAI and provides defence and security news from Canada and around the world. Blog updates are made by CDFAI fellows, the majority coming from Mark Collins. CDFAI organizes a speakers series which is annually themed on a specific topic of importance to Canadian defence and foreign affairs issues. The speaking events are held quarterly in Calgary and brings together business people, academics, and praticioners to listen to some of Canada's mosat important and influential thinkers. Former speakers include Peter MacKay, Minister of National Defence; Michael Bell, former diplomat; and Yuen Pau Woo, president and CEO of the Asia Pacific Foundation of Canada among others. From 2002 to 2010 CDFAI hosted annual conferences in Ottawa around critical issues in Canadian defence and foreign policy. These conferences attracted high-calibre speakers, key policy makers, prominent academics, and a large number of the interested public. Canada & The United States: What Does It Mean To Be Good Neighbours? The Ross Munro Media Award was initiated, in 2002, by the Conference of Defence Associations, in concert with the Canadian Defence and Foreign Affairs Institute. Its purpose is to recognize, annually, one Canadian journalist who has made a significant and outstanding contribution to the understanding, by the general public, of Canada’s defence and security issues. Submissions can be made in either of Canada’s official languages. University of Calgary and includes a combination of media-military theory in a classroom setting, coupled with field visits to Armed Forces regular and reserve units. The stated goal of the program is to enhance the military education of future Canadian journalists who will report on Canadian military activities domestically and abroad. In 2007, the program introduced its first Francophone Military Journalism course held at the Université de Montréal and Canadian Forces Base Valcartier, near Québec City. Eight directors focus on governance, stewardship and external relations. Robert J. S. Gibson - Managing Director of Alsten Holdings Ltd., currently holds the position of Honorary Colonel of the Calgary Highlanders since 2002. Bob Booth - Senior partner in the Calgary office of Bennett Jones LLP and is a director at ATCO Ltd. and at Canadian Utilities Limited. Robert B. Hamilton - Executive with the Royal Bank Financial Group. Board member of the Alberta Children's Hospital Foundation, the Calgary Stampede Foundation, and the Wilfrid Laurier University Board of Governors. Steve Letwin - President and Chief Executive Officer of IAMGOLD. Director, Corporate Campaign Committee of Texas Children's Hospital; Patron, UNICEF Alberta, Canada; and Director, YMCA Calgary, Canada. Robert S. Millar - Former Brigadier-General in the Canadian Forces and founding President of Canadian Defence & Foreign Affairs Institute. Michael M. Shaw - 30 years with the AVIVA Canada, Cash Store Financial Services Inc., and ITC Construction Group. Fourteen advisors provide feedback on current and future programs. Denis Stairs, Pearson Peacekeeping Centre. Jocelyn Coulon - Director of the Peace Operations Research Network, at the Centre d'études et de recherches internationales de l'Université de Montréal. Robert Fowler - Former Deputy Minister of National Defence, Ambassador to the United Nations, Italy and UN Special Envoy to Niger. Jack Granatstein, OC, FRSC - Historian specializing in military history. Former director and CEO of the Canadian War Museum. Peter Harder - Senior Policy advisor at Fraser Milner Casgrain. President of the Canada China Business Council. Former Deputy Minister of Department of Foreign Affairs and International Trade. Dan Hays, PC - Senator from 1984-2007 and former Leader of the Opposition in the Senate. Senior partner with Norton Rose Canada. Raymond Henault, CMM, MSC, CD - Chief of Defence Staff from 2001-2004 and Chairman of the NATO Military Committee from 2005-2008. Don Macnamara, CD - First Chair of the Canadian International Council's Strategic Studies Working Group and is the current Chair of the Board of Governors of the Royal Military College of Canada. John Manley, PC, OC - President and Chief Executive of the Canadian Council of Chief Executives. Former Deputy Prime Minister of Canada and Minister of Industry, Foreign Affairs and Finance. David Pratt, PC - Member of Parliament from 1997-2003 and former Minister of National Defence from 2003-2004. New Democratic Party from 1974-1981. Robert G. Wright - Canadian Ambassador to Japan from 2001-2005 and to China from 2005-2009. David Bercuson, OC, FRSC - Full-time professor at the University of Calgary, Director of the University's Centre for Military and Strategic Studies and Director of Programs at the Canadian Defence and Foreign Affairs Institute. Andy Leslie, CMM, MSC, MSM, CD - Attained the rank of Lieutenant-General and served as the Chief of the Land Staff and Commander of the Land Forces (Army). In 2010 he was appointed Canadian Forces Chief of Transformation and tasked with reporting on where future funding for the CF should be directed. Retired from the Canadian Forces in 2011 and is Senior Vice President at CGI Group. Colin Robertson - Honorary captain in the Canada World Youth. Barry Cooper - Teaches political philosophy at the University of Calgary. Publishes a regular column in the Calgary Herald and other CanWest Global papers. Fellow of the Royal Society of Canada and of the Centre for Military and Strategic Studies at the University of Calgary. Daryl Copeland - Served as a Canadian diplomat to Ethiopia, Malaysia, New Zealand and Thailand. Author of the book Guerrilla Diplomacy: Rethinking International Relations, released in July 2009. Centre for Military and Strategic Studies. Center for North American Studies. Canadian Association for Security & Intelligence Studies. Canadian Research Network on Terrorism, Security and Society. Mark Collins - Former Canadian diplomat to Pakistan (covering Afghanistan) and Yugoslavia (covering Bulgaria). Canadian Forces School of Aerospace Studies. Laurier Centre for Military Strategic and Disarmament Studies. George MacDonald - Senior Partner with CFN Consultants. Former Vice Chief of the Defence Staff from 2001 to 2004. John Noble - Former Consul General to Monaco, and former ambassador to Greece, Switzerland and Liechtenstein. Fellow at the Weatherhead Center for International Affairs at Harvard University; a Senior Distinguished Fellow of the Norman Paterson School of International Affairs at Carleton University. Stephen Randall, Latin American Research Centre. Hugh Stephens - Executive-in-Residence at the Asia Pacific Foundation of Canada and Vice Chair of the Canadian Committee for Pacific Economic Cooperation. Derek Burney, OC - Former Ambassador to the United States 1989-1993 and chief of staff to the Prime Minister 1987-1989. Senior Strategic Advisor at Norton Rose Canada. Visiting Professor and Senior Distinguished Fellow at Carleton University and Chancellor at Lakehead University. Sharon Hobson - Canadian correspondent for Jane’s Defence Weekly. Royal Canadian Artillery Heritage Campaign. Eric Lerhe - Former Commodore, Commander of Canadian Fleet Pacific and Task Group Commander in the Persian Gulf during the War on Terror in 2002. Cameron Ross - Major-General (retired), Formerly a University of Calgary. With some of Canada’s leading experts on the Arctic, Military history, the Middle East, US-Canada Relations, Military Security and International Relations, the research conducted by CDFAI is helping to shape Canada’s global engagement. CDFAI Fellows regularly provide expert commentary and analysis of ongoing international events in TV and print new media. The University of Pennsylvania ranked CDFAI 4th in its list of Top Think Tanks in Canada in their 2012 "Global Go-To Think Tank" Rankings.